Is this what a sense of purpose looks like? While we understand that there are more dimensions to a person than their work, we tend to think of them as secondary at best: someone who has a rich inner life but has trouble getting a job is not going to be invited to give a commencement address. No one will be impressed if you go to your 20 year reunion and say you’ve spent the last several years being a great friend. For the most part, western culture only pays lip service to the aspects of selfhood that don’t look good on a résumé. I’m not sure that was ever a good idea, but it certainly made sense in a world where a group’s survival depended on everyone pulling their weight. But … let’s be honest … that hasn’t been Western culture for quite some time. A culture where the cast of Jersey Shore can make more than all the teachers in a school district and all the workers on a factory floor combined is one that’s teetering on the edge of annihilation through excess, not want. If anything, we’re a culture that could use an infusion of character rather than ambition. 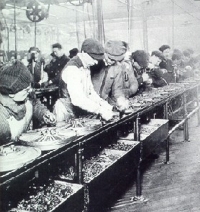 Still, our notion that we are our jobs has been able to sustain itself because there was plenty of work to go around. It’s hard to see how we’re going to change our minds about “the measure of a man” when we can reasonably expect people to go out and get jobs. But that may no longer be the case. As I’ve written elsewhere, the hallmark of our new economy appears to be a “personless recovery.” Where previous economic recoveries were caused by businesses hiring, this time around companies are recovering by discovering that they don’t need to hire at all. Automation and efficiency can make up (at least on paper) for what people used to do. Now Slate’s Farhad Manjoo is writing a week-long series on automation – and the way in which even highly educated careers are increasingly vulnerable to being replaced by a robot or a software patch. Other thinkers, like Jaron Lanier, have been warning us about this for years. The impact this will have economically is a big question, and one worth debating elsewhere. The question to ask here is: if there’s genuinely not enough paying work to go around, then what are we going to ask our kids? What are we going to ask strangers at parties? What other hook besides “work” will we end up hanging our sense of self on? What does it mean to be human in the west if there isn’t paying work for a majority of westerners? This is as existential a question as a society can ask. We know what to do in a time when there’ s work to be done: we put our shoulders into it, our noses to the grind stone, and the tough get going. We’ve got cultural expectations so deep they’re clichés. Do we have any similar set of expectations for a time of abundance? Do we have the cultural infrastructure in place to create expectations that are both meaningful to the culture and the individual? No – we really don’t. But we certainly have the intellectual heritage: Victor Frankl and Rollo May and a whole line of humanists going back centuries were charting the parts of the human experience that have nothing to do with getting a paycheck. This is not new territory — especially for humanistic thinkers. But that doesn’t mean our culture can accept it. While the best case scenario is that we find meaningful ways to live in an economy of abundance, the worst case scenario may be that jobs don’t return … and we don’t adjust. That we live in a society of abundance that we cannot appreciate, because we cannot stop judging each other by what they do from 9-5. I’m afraid that counselors and psychologists have their work cut out for them.